How did you first learn about post-graduate service? I learned about my particular service program through Catholic Volunteer Network’s website. I saw an immediate posting for the Franciscan Volunteers program in Aston, PA, and I happened to be looking for a faith-based opportunity for the near future. Additionally, I was already living in Philadelphia, so it wasn’t a huge move for me. When I found out I could serve on a farm, I became very interested in applying to the program, and I contacted our program director, Sara Marks. What other options were available to you, and why did you decide on your service program? This fall, I was deciding between a couple of service programs as well as a few full-time jobs. I had just finished a summer position working with the Free Library of Philadelphia on a children’s literacy program, and was interested in continuing some form of direct service, but this time, in a faith-based environment. I applied to different full-time positions in the areas of youth ministry, social justice advocacy, and faith-based education, but I didn’t have much luck. I decided to look on the Catholic Volunteer Network website, and there I found postings for two different service opportunities that appealed to me. 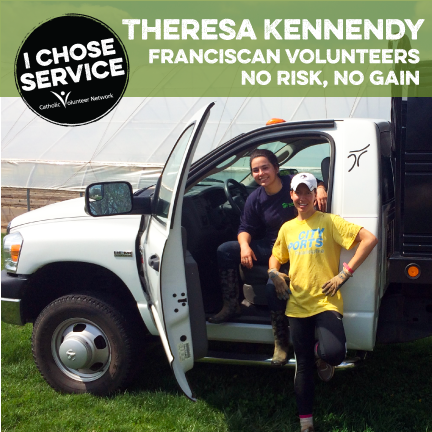 After visiting both programs, and comparing the direct service versus indirect nature of each program, I decided to pursue the Franciscan Volunteers program in Aston. Here I would be within a smaller community and working on an organic farm. The opportunity to be outside and working with food and nutrition really interested me, and so for a number of reasons, this is the program I chose. I feel confident that I would have greatly enjoyed and grown from the other program I visited, but felt called to pursue the Franciscan Volunteers program, and have been very grateful for what I have learned and how I have grown this year. Share about your service placement and volunteer community experience. As a long-term volunteer on Red Hill Farm, I perform farmhand duties to keep the farm running daily and from season to season. In addition, I co-teach “farm-to-school” nutrition classes and cooking classes three times a month to the third and sixth grades at an urban Catholic school nearby. Red Hill Farm is a CSA (community-supported agriculture) farm in a rural Philadelphia suburb. It is owned by the Sisters of St. Francis of Philadelphia, and has been functioning on an organic produce-only farm-share model for over 17 years (though the farm has existed for many years, and even had cows at points!). My work on the farm includes seeding, planting, weeding, tilling, irrigating, washing, harvesting—you name it! I am humbled by the experience, and have become so much more aware of and grateful for the workers who put the food on our table each day, as it is hard work! It has been a blessing to be outside each day (in all types of weather!) functioning as one with the earth. My experience with community has been extremely fruitful. It is the first time since high school that I really have functioned in a family-type setting, as I am accountable for what I do (or don’t do), where I go, and how I act. It was, at first, a more challenging transition perhaps than I had expected, but it has proven to be so rewarding. I have met two wonderful women with whom I pray, cook, talk, laugh, do yoga, and cry. By living with others, you certainly get to know them well. Though we have had our struggles with communication and responsibilities of duties, we have had to work through them, and as a result, our skills in these fields have developed greatly. These skills are absolutely necessary for life, and I am so thankful to have grown and shared with my community in the process. What benefits have you gained from this experience that you might not have received otherwise? My spiritual growth has been exponential this service year. My faith life has developed so much in terms of prayer, theology, and personal practice. I have learned about the Franciscan charism, theology, and all about St. Francis’ life. I have participated in new worship styles, including Taize, contemplative prayer, and meditation. I have developed a more intensive daily personal practice of prayer, reading, and meditation. I have met regularly with a spiritual director, formed deep relationships with the sisters, and shared my faith daily with my community members. Spiritual development has been probably the greatest aspect in which I have grown this year, and I am so thankful for this. 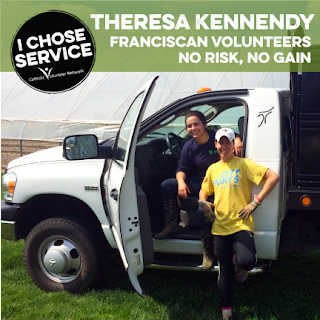 Franciscan Volunteers has been true to its mission of faith formation. Though faith formation has been the greatest space of growth for me personally, I have also grown personally and professionally. My personal development has been through my community life. I have become a more accountable, responsible person, and a much better communicator. In terms of professional development, I have become more confident in my skills and talents, and have been willing to share my ideas more easily. I have also come to value my co-workers more than ever before, as fellow brothers and sisters who need and deserve love and respect just as I do. I feel very prepared for whatever the next step in my life will bring. What advice do you have for someone considering post-graduate service? I would say to do it! Take the chance (As Mother Bachmann said, “No risk, no gain,” which is where the name of our program comes from). There is so much that we can learn about ourselves and others, and the relation between ourselves and others, which is so necessary for finding ourselves and figuring out who we want to be. In the early years out of college, we begin to solidify the person we hope to be for the rest of our lives, and it is for this reason that a year of service can truly have a lifelong impact. So, take the chance! No risk, no gain. Challenge yourself to be vulnerable, learn by doing, and find your God-given purpose.